Woo Hoo!! 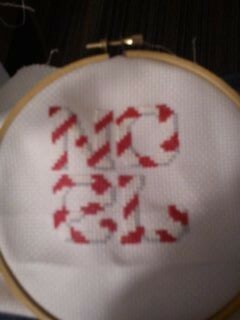 I finished the Noel today! And of course after I finished and looked it over, I saw a pretty big mistake. But we'll let it float :) The pattern did call for a single red line through the white to make it look candy caneish. I want to do it with sparkly thread, so I'll have to wait for that to come in. I also want to jazz it up a little but just don't know what to do. Buttons? Something sparkly? I don't know, what do you think? He is a pretty big piece to work on. I think it's going to take me awhile to finish this one. Last month I did this little guy, planning to turn him into a little card for my parents. Well, you know the best laid plans!! I never did get it made in to the card, maybe this year!! Sorry they aren't the greatest pics. Again, cell phone cam. Can't wait till February when I can replace my camera!! Also sorry for the odd spacing of these suckers. This is a new way of doing the pics for me and I haven't figured blogger out yet. James has a gig tonight, I just fed the boys nachos, so I'm ready to settle in with some stitching. I was so upset last night about 10pm. 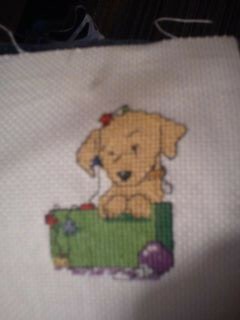 I was stitching Noel and then it dawned on me, it was Thursday night. I had missed GA and Private Practice. So bummed. I'll see if they are up on the web to watch tonight. In the mean time I'm still watching X-Files. I'm into Season 3 now :) Anyway, hope everyone is having a great day! You are doing a great job blogging too. @ Vicy, thank you for the compliment. 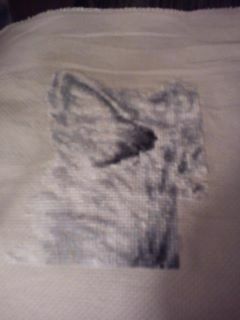 I have so far to improve on my stitching! @ OctoberLace, what kind of sparkle? Beading? I was thinking about maybe some holly leaves, but am not sure what to find a pattern tiny enough? Shanda, Noel is beautiful! Congrats on the finish! The wolf piece is going to take awhile, but oh, so worth all the time put into it! 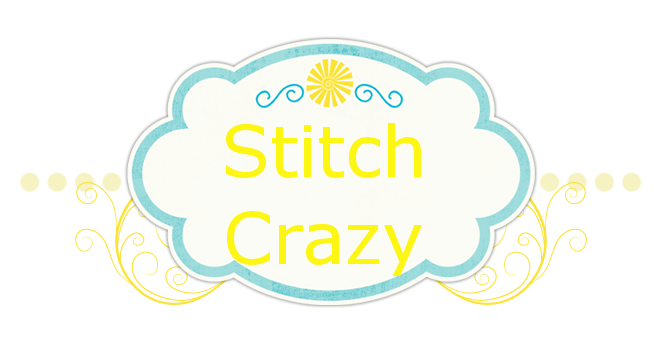 All your stitching looks wonderful! Nice job! Love your progress pics. You missed 2 good shows. Hope you watched them online. Lovely progress. Can't wait to see more of the wolf.